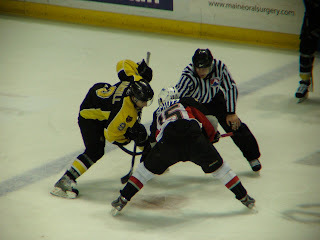 The Portland Pirates are on the edge of being knocked out of the playoffs by the Providence Bruins. The Bruins dispatched of the Pirates 2 -1 Thursday night at the CX4. This was wide open playoff hockey at it's best. Both goalies played strong, facing a combined 69 shots on goal. Providence Bruins Head Coach Rob Murray described it best, "both goalies played unbelievable..quality scoring chances...point blank chances..(the) goalies earned their money tonight." The Pirates broke the scoring ice, taking a 1 - 0 lead at the on a beautiful rush on the right side by Marek Zagrapan who nailed a pass to Mark Mancari, who drilled the puck in the wide open net. The Pirates has a shot to go up 2 - 0 when Bruins Center Zach Hamill hauled down the Pirates Colin Murphy from behind on a breakaway. Murphy went center, drifted left and tried to come back right with a backhand. Murphy said Rask was right on it. "(I) was just trying to go backhand..like I said he was playing well...brought his stick with him...followed me and made it look easy." The first period ended with the Pirates holding a 1 - 0 lead. Most of the 2nd period was back and forth rushes by both teams facing tough goaltending. The highlight of the period was a shoulder save by Jhonas Enroth on the Bruins Mikko Lehtonen. Lehtonen came out from a right corner scrum clean, squared up Enroth and tried the 3 hole to no avail. The Bruins persistence around the Pirates net finally paid off at the 17:13 mark of the 2nd when Vladimir Sobotka went from the right circle acroos the crease and somehow, in a crown, fed the puck to Brad Marchand who buried a blast by Enroth for the 1 - 1 tie. The tie did not last long as bruins RW Kirk MacDonald came out of the corner and flipped a top shelf wrister past Enroth for the 2 - 1 lead at the end of 2 periods of play. The 3rd period was a wide open as it get. On the verge of losing 2 at home, the Pirates opened things up. Bruins Goalie Tuukka Rask said his defense made the difference. "there were a couple of chances that were guaranteed goals," Rask said "(but) the guys helpd me a lot today." The Series now moves to Providence tomorrow night for Game 5.